The shocking tale told in How I Helped O. J. 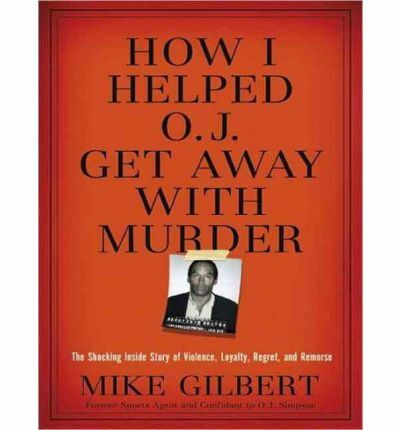 Get Away With Murder is unlike anything you've read before; it isn't Mike Gilbert's "version" of what happened-it's the unvarnished truth: the truth about O. J., the murders, and the infamous trial. Not as Gilbert imagined or would like it to be, but how it actually was. Gilbert doesn't spare anyone, not even himself-he helped deceive the jury and feels deeply responsible for the "Not Guilty" verdict.So why is Gilbert speaking out now? Has he gone from sinner to saint? Is he making a play for sympathy or looking to make a quick buck? No. (Proceeds from this book are going to March of Dimes and other selected charities.) Gilbert has written this book because he regrets what he did for his adored childhood idol. He can no longer find any excuse for how he has shielded O. J. Simpson, and he is determined to tell the full truth, including: -O. J. 's late-night confession to Gilbert-How Gilbert was responsible for O. J. 's hand not fitting the murder glove-Why O. J. murdered Nicole Simpson and Ron Goldman (it was more than jealousy)-Why Gilbert defended O. J. for so long-and what finally convinced him he could do so no longer- How O. J. ignored his financial obligations to the Goldman family and milked the tabloids for money-The real reason why an armed O. J. burst in on the memorabilia collectors in Las Vegas (Gilbert had what O. J. was looking for) Told with searing candor, no one comes out of this book with his reputation intact-including Gilbert's own. But he casts a glaring light on how celebrity can corrupt, how power can mislead, and how friendship and loyalty can be perverted. His book is meant to set the record straight, to lay to rest the ghosts of that dreadful night that have haunted him ever since, and to now play what little part he can to forward the process of justice. About the Author: Gilbert works at Microsoft as a program manager designing object models for business productivity and Web collaboration products. He is also a regular speaker at conferences such as Microsoft Tech*Ed and the Microsoft Office and VBA Solutions Conference.Foster received an MA in Theater from the University of Michigan.